I’m sure many of you have seen the show, Hoarders about people who are basically pack-rats and can barely move around in their own homes. Many of the episodes are pretty tough to watch as the hoarder hasn’t cleaned in eons and there’s generally animals around the place – and well – you get the idea. I’m gonna talk about a different kind of hoarding, which I’ll call “digital hoarding“. If there was a show for it – I’d be featured. You see – I’m a digital hoarder. And, it’s costing me money and time. Case in point. This is a screenshot of my desktop – right now. I can hear the collective “ooooohhh’s”. I know, it’s bad. But like my belly, I’m working on it. Here’s why you should too (work on your digital hoarding that is). Time is a valuable resource because it’s something that is depleting. That’s why you can put in an 8 hr. workday (and sometimes not do a lot) and they’ll pay you for it. And, I can’t begin to tell you how much time I’ve wasted looking for files. Perhaps I’m a glutton for punishment or have a screw loose somewhere – but I can’t seem to get it into my head that if I just filed things right away – I would save time later on (when I can’t remember where I put it!). It’s a pretty simple concept – right? It is true: time = money. Wasting time looking for files is time that could be spent, making money. Get rid of your hoard of files – and you could be making more moola! Time to get with it, Aaron. Not only does our digital hoarding affect us – it can (and often does) affect others. I sometimes have been unable to locate a file for someone – even though I know it is on my system somewhere. That’s no good. According to Microsoft – having a bunch of icons and things sitting on your desktop (a la, me) can slow down the performance of your computer. And if it’s slowing your computer down – it’s slowing you down – which further compounds the problem at hand. For me, there are years of habitually not filing things or throwing things out. So it’s a bit daunting. But, one must start somewhere – and that can be today. One of the goals in our Personal Finance Challenge this year is to “get rid of crap“. It doesn’t just have to be physical goods – so I’m making tossing out my excess digital files and organizing things – part of that goal. Why don’t you join me? Perhaps we’ll have an update to this post down the road and share our before and after desktops! Are you a digital hoarder too? It’s okay to come out. I won’t tell anyone. Are Dollar Stores Cheaper Than Other Stores? I think I have a bit of a problem with this too. 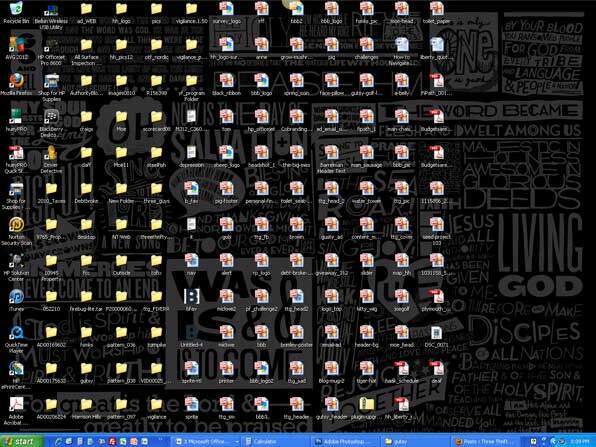 I hoard a lot of computer files, but at least it is all organized in folders which reduces the time wasted. Still, it all does contribute to slowing down my computer. As for XP, I’m still rocking it too on this computer. I have Windows 7 on my other laptop, but I’m just too cheap to upgrade this one. Jeremy – Glad I’m not alone in hoarding and XP – haha. I read an article in the Wall Street Journal recently about this. Some people hire digital counselors to help them with the emotional aspects of digital hoarding…it’s pretty intense. They talked about how people are afraid to delete anything because they might need it one day. One guy even kept emails and chats from decades ago because he wanted to hold on to the memories! Maybe I need to hire one of those people! Haha.. sounds like me. Yup – still in the dark ages. It’s pretty stable though!